Theatre, in its distinctive artistic form, reveals and imparts the complexities of the human condition. The department exposes students to the methods and applications that theater can bring to the educational process through course work, theater production, community-based theater and professional outreach. 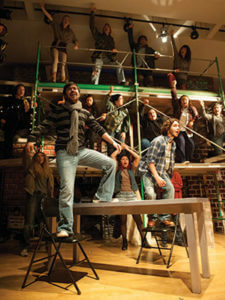 Much of the focus of the Department of Drama is not only in the educational and professional development of its students, but also in advocating an appreciation of theater in the cultural life of the University. Students can earn a minor in Drama and students of all majors may take Drama courses to fulfill the requirements of the Core Curriculum. Students can pursue a Drama minor with a concentration in Performance or Technical Theatre. Stage productions by St. Mary’s students go way back in our history, at least to 1895, as documented in our archives. Students of a majors are welcome to audition to participate in StMU Theatre, on stage or behind the scenes with our technical crew, costume designers and much more. Drama students have been placed in paid internships with local and national organizations, offering an avenue to professional theater practice. They have worked with companies such as Magik Children’s Theatre, the Barshop Jewish Community Center’s Sheldon Vexler Theatre, McNay Art Museum, The Playhouse and the Scioto Society of Ohio, gaining valuable experience with each. Drama graduates have gone on to work as teachers, directors, performers and technicians in educational, community and professional theater organizations across the country.